Get a sense of the local culture at Sea Fortress Suomenlinna and Helsinki Cathedral. Head to Market Square Kauppatori and Artekfor plenty of shopping. 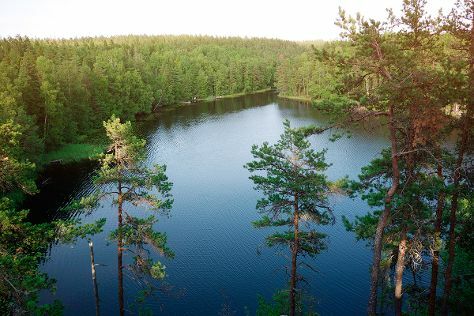 Explore the numerous day-trip ideas around Helsinki: Teijo national park (in Pernio), Sipoonkorven Kansallispuisto (in Vantaa) and Nuuksio National Park (in Espoo). The adventure continues: pause for some serene contemplation at Rock Church, tour the pleasant surroundings at Pornaistenniemi Nature Trail, take in the spiritual surroundings of Uspenskin Cathedral (Uspenskin Katedraali), and take a stroll through Katajanokka. Take the guesswork out of planning a Helsinki vacation by using our trip itinerary maker. If you are flying in from India, the closest major airport is Helsinki Vantaa Airport. In May in Helsinki, expect temperatures between 18°C during the day and 7°C at night. Finish your sightseeing early on the 20th (Mon) to allow enough time to travel back home.